Two firearms and several rounds of ammunition were seized in the volatile community of Flanker in St. James on Monday, as the joint police/military ‘Operation, Take Back St. James’ continues its crackdown across the parish. The seizure brings to four the number of weapons seized since the State of Public Emergency was declared last Thursday. Reports indicate that a joint military team went to Rifle Lane in Flanker where a search was conducted in a culvert, when an assault rife with two magazines containing 17, 7.6 mm rounds, and one automatic pistol with one magazine with 7 9mm rounds, were found and seized. No one was arrested in connection with this find. 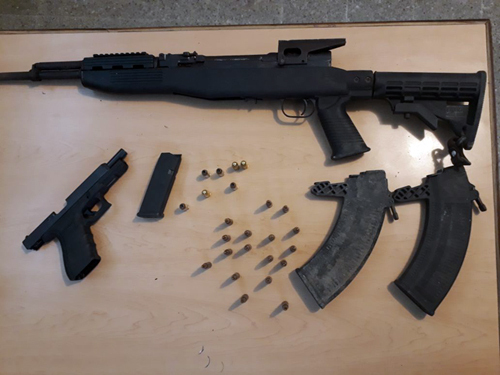 Monday’s gun seizure follows that of Thursday, January 18, when five suspects were nabbed in a special, targeted operation conducted by a joint police/military team about 12 noon in Flanker, and an AK 47 rifle with live rounds seized. The five, including three teenage boys 14, 15 and 16 years, are believed to be responsible for major crimes including shooting and murders committed in Montego Bay. Another gun was seized at the scene of a fatal shooting at a funeral service in Quarry, Montego Bay on Saturday. The weapon seized on Thursday is reported to have featured in a brazen murder along Sunset Boulevard near the Sangster international Airport on Tuesday January 16. In the meantime, the weapon is to undergo forensic and ballistic tests to determine its history.